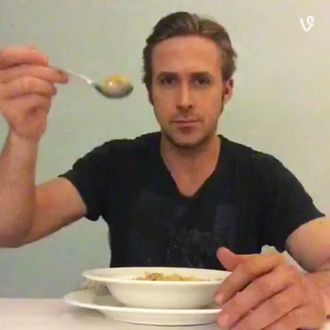 Two years ago, Vine user Ryan McHenry started a popular series called “Ryan Gosling Won’t Eat His Cereal,” a charming, silly batch of shorts that poked fun at Gosling’s many serious faces. In them, McHenry would hold up a spoonful of cereal to a clip of Gosling in his films or interviews, either backing away from, swatting, or staring in horror at the spoon. They were hilarious and, like “Hey, Girl” before them, turned into yet another viral Ryan Gosling meme. Sadly, later that year, McHenry was diagnosed with osteosarcoma and died on Sunday at 27 years old. All this time, Gosling was very aware of the Vines, and as a touching and appropriately humorous send-up to McHenry, Ryan posted a Vine Monday night in which he finally eats his cereal. My heart goes out to all of Ryan McHenry's family and friends. Feel very lucky to have been apart of his life in some small way.